If you have a Go-Daddy free-site this is how you can hide the advertisements to display in the browsers. If you do not have an existing CSS file, it is quite easy to create. Open your favourite text editor. Copy a paste the above code in it. Upload the file to the root directory or a directory(folder) of your choice to your Web host. Add the following code before the </head> tag in your existing pages. Remember to save or upload the files to your Web Host. Well I was actually looking around for WordPress Themes for my new website, then Ian Stewart' Launchpad gave me a great idea for making a html template for websites that is not quite ready yet. When you’re getting ready to launch your website, most of the hosting companies and/or registars offers a parked domain, that can turn your site into an advertising campaign for them. I am also not a fan of the "Under Construction" pages. Now you can park your domain in style! I’ve implemented it on my new Web site. Preview it here. GPL Licensed – you can do with it what you want to. For more info, read the RSS 2.0 Specifications. You can update the file with your information in any text editor. Remember to save. Upload the file to your host. Enter the full URL of your RSS file into the form. Click the button. If there are any errors, the validator will tell you about them. Otherwise, it will validate your file. Subscribe at http://feedburner/google.com, follow the instruction to get your feedburner links. You can update the file in your favourite html editor or text editor. Update the page's title with your own. If you want to use a favicon, make sure to upload your icon to the host and remove <-- Favicon disabled, as well as -->. If you want to use a logo, make sure to upload your logo imagefile to the host and remove <-- Logo disabled, as well as -->. 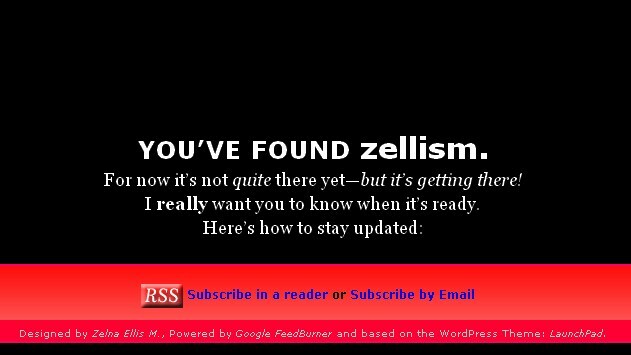 In <h1><span>You’ve found </span> zellism.</h1> replace zellism with your name. In the subscribe-options division, replace the feedburner URI with yours. Save your file and upload your file to your host. Head over to http://validator.w3.org/ to validate your file. Enter the URL of your HTML file into the form. Click the button. If there are any errors, the validator will tell you about them. Otherwise, it will validate your file. Now you can have a professional looking parked domain theme. If you need any more help, feel free to leave a comment on this post or contact me by e-mail. Hope this will help you to have a professional looking site while it is "UNDER CONSTRUCTION". This is the last post regarding HTML Links. HTML Links – Part 2. HTML Links – Part 1.
charset=Character-set The Character Encoding of the document in the target URL. coords=Coordinates Coordinates used with an object or img element. href=URL The target URL of the link. hreflang=LanguageCode The language of the document in the target URL. name=BookmarkName Create a bookmark in a document. rel=Relationship The relation of the target URL to the current page. rev=Relationship The relation of the current page to the target URL. shape=Shape Defines the shape of a link. target=Target Specifies where the target URL will open. type=mimeType Specifies the MIME type (content type) of the target URL. In the earlier days of the web ASCII was the default character-set. These days the default character-set for modern browsers is ISO-8859-1. Another common character-set is UTF-8 (Unicode). Note: Remember a browser doesn’t understand all of the character-sets. The coords attribute is used together with the shape attribute to specify the size, shape, and placement of a link in an object or img element. The coordinates of the top, left corner of an area are 0,0. Note: Not supported in all browsers!!! x1,y1,x2,y2 If the shape attribute is set to “rect”, you need to specify the coordinates of the left-top corner and the right-bottom corner of the rectangle. x,y,radius If the shape attribute is set to “circ”, you need to specify the coordinates of the circle center and the radius. x1,y1,x2,y2,..,xn,yn If the shape attribute is set to “poly”, you need to specify the coordinates of the edges of the polygon. If the first and last coordinate pairs are not the same, you need to specify the last coordinate pair to close the polygon. Have a look at the previous two posts: HTML Links – Part 1 and HTML Links – Part 2. A two-letter language code that specifies the language of the document in the target URL. Create a bookmark in a document. Was discussed in HTML Links – Part 1. The relation of the target URL to the current page. alternate An alternate version of the document e.g. translated, mirror, etc. appendix An appendix of a selection of documents. chapter A chapter of a selection of documents. contents A table of contents for the document. copyright A document containing copyright information. glossary A glossary (explanation) of words used in the document. index An index for the document. next The next document in the current selection. prev The previous document in the current selection. section A section of a selection of documents. start The first document in a selection. stylesheet An external style sheet for the document. subsection A subsection of a selection of documents. The relation of the current page to the target URL. This is the opposite of the rel attribute. rect Defines a rectangular region. circle Defines a circular region. poly Defines a polygonal region. _self Target URL will open in the same frame as it was clicked. _parent Target URL will open in the parent frameset. _top Target URL will open in the full body of the window. framename Name of the target frame the URL should open in. _tab Target URL will open in a new tab page if the browser supports it, otherwise in a new window. Specifies the content type of the target URL. A list of registered content types can be find here. Note to Facebook Note Readers: Facebook Notes is not supporting tables, rather view the original post. This was the last part of HTML Links. This is a follow up from HTML Links – Part 1. In this post we are going to have a look how to use a picture/image as a link as well as E-Mail Links. Using an image as a link. Note: The Image File can be any format, jpeg, bmp, tiff, etc. With this example it will open the client’s default e-mail program, create a new message, add a recipient in the ‘To’, ‘cc’, ‘bcc’ fields and also a short message in the ‘message text box’ (body of the message). Note:Use %20 instead of spaces in the sucject line and body text so the text will be displayed correctly. In the next post we have an indepth look at all the attributes of the <a> Anchor tag. The link also known as the hyperlink, refers to the resourse(URL)/document on the Web: An image, web page, movie, sound, image file, etc. Note: The XHTML & HTML code is the same. The href attribute indicates the destination. The target attribute specifies where the linked document will be opened. _blank The target URL will open in a new window. _self The target URL will open in the same frame as it was clicked. _parent The target URL will open in the parent frameset. _top The target URL will open in the full body of the window. framename The name of the target frame the URL should open in. _tab	The target URL will open in a new tab page. When the name attribute is used, the <a> defines a named anchor inside the document. This is not displayed in any special way. The importance is to create a link to the named anchor. Remember if a browser cannot find a named anchor that has been specified, it goes to the top of the document. No error occurs. This was a quick introduction to links. In the next post we have at look at some more links.